KM Modules are used for fitting roof windows in mansard roofs. Windows are positioned one above the other and joined with the mansard module. 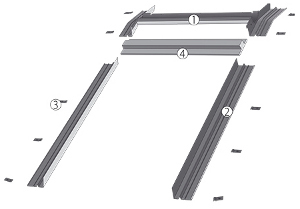 Only one type of module is available, allowing window installation at a depth V (0) in the roof construction. Module KM is available in two versions. Module KMV is a universal version, allowing roof windows to be fitted with most roof coverings (S, Z, H), whereas KMV-L is for installation on tiled roof coverings only. The top window is installed at angles between 15° and 60°, and the lower window between 45° and 90°. The internal angle of the mansard roof should be between 105° and 150°. The mansard module can be manufactured in aluminium, copper or titanium- zinc. The KMV, KMV-L flashings for aluminium-plastic windows installed in mansard combination are available to individual order. Comprised of the element joining the roof windows and the side elements of the lower window. The KMV module also includes side-sealing channels to provide protection against wind blown dust, leaves, rain and snow.